Who knew Hitler could be a YouTube hit? 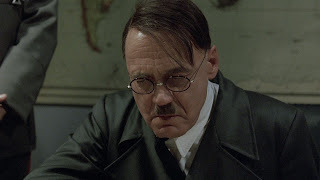 The stream of variations of 'Hitler is angry' and 'Hitler is informed...' recycles movie clips, but rewrites the English subtitles so that the Dictator appears to vent about lightweight grievances of modern life, ranging from iPads to football transfers. These are actually scenes from the 2004 film Downfall, usually when Hitler blames his staff for not informing him how much his troops have lost ground to the Allied forces. 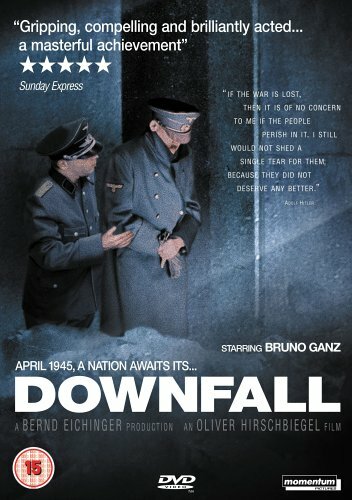 I was prompted to see Downfall when I realised that producer/writer Bernd Eichinger and actor Bruno Ganz had worked together on this before The Baader-Meinhof Complex (2008). I also wanted to see if the YouTube phenomenon might affect newcomers to the movie. I found it engrossing, but also a doom-laden, claustrophobic experience. While I've always sought out horror movies, recently I'm finding well-made reality-based dramas far more horrifying than fiction. It's not the first portrayal of Hitler's final days. There's been Hitler: The Last Ten Days starring Alec Guinness, and The Bunker starring Anthony Hopkins. It's a temptingly dramatic story. The dictator's death signalled the end of the Third Reich, Nazi Germany and World War II in Europe (Japan held out a little longer). 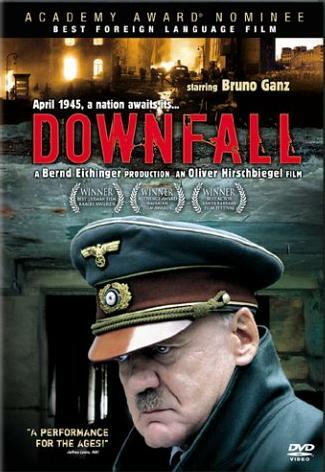 Downfall is the latest version, and the first to be made by Germany, with the added benefit of a new and thorough eyewitness account from Hitler's secretary, Traudl Junge. The story uses her as a central thread to the narrative, from when she first joins Hitler's staff in his reinforced concrete bunker. Crucially, Junge worked with him as the Russian forces finally approached the hideout, and were simultaneously closing in on Berlin. As commander of Germany's forces, Hitler refuses to surrender even though it means the continuing deaths of his outnumbered troops, as well as the civilians left in the city. Despite the desperate situation, his loyalty to his own extreme ideals threaten to drag everyone down with him. 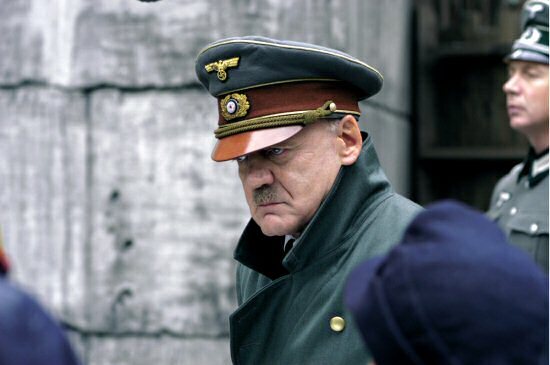 Hitler is undeniably a complex role to portray in any depth, with the added challenge of having to distance the portrayal from every comedian's manic impression. 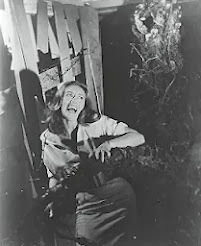 Previous adaptions usually had actors speaking English with a German accent. But Downfall benefits from everyone speaking German. Bruno Ganz (Harker in Herzog's Nosferatu, lead angel in Wim Wenders' Wings of Desire) even had access to a rare recording of Hitler in conversation, in order to accurately mimic his ordinary speaking voice. Hitler's secretary, Traudl Junge, had remained silent about the events she witnessed for much of her life. 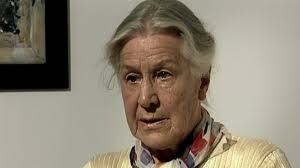 In her last years she helped write an account and appear in a documentary about her time with Hitler, when she was living and working in close quarters with him and transcribing his thoughts, right until his final testimonies. The publicity emphasised this new account, though Downfall uses several other accounts, adding perspectives on what was happening elsewhere, particularly in Berlin. The production was controversial because the German people were still very afraid that any realistic portrayal of Hitler would show him as a human being, and therefore sympathetically. But of course he was human, and Downfall dares to show the Hitler we don't usually see. Not grainy footage of of him shouting and gesticulating his speeches to the troops. Here he can be quiet, considerate, good with children and animals... 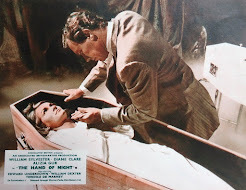 But it's carefully presented as a paradox, showing that he was capable of compassion, even though he abhorred it as a weakness in anyone else. Under increasing pressure, his beliefs look like insanity to even his most trusted believers. Downfall isn't just about historical events, but also an insight into the mentality of the Nazi leadership, and the strength of loyalty that enabled them to commit their crimes. Their lack of compassion extended to German civilians and their own families. The last nightmarish events in the bunker, on Chancellor and Frau Goebbels' final day, are even more as horrifying than the carnage on the streets of Berlin. I started watching with a sense of dread, that reminded me of Titanic. I knew roughly what was going to happen eventually, and dreaded when and what I was going to see. The two and a half hours running time was a fascinating education and a haunting experience. The grim siege atmosphere where people coldly contemplate suicide over dinner. The horrible tension that the killing will continue as long as he's alive. It's useful to know a little about the end of World War II beforehand, as there's little historical context included for newcomers. Knowing a little from a few documentaries didn't ready me for how powerful it was as a drama, rather than simply summarised in a voiceover. The YouTube spoofs didn't spoil the film as I feared. I was already completely drawn into the story by the time that scene appeared. Don't get me wrong, I find them very funny. But I'm conscious that we only see Hitler played for laughs now - like when he pops up in Family Guy. He shouldn't just be a comedy character. Inglorious Basterds was a welcome change, to see a more visceral and emotional response to him. 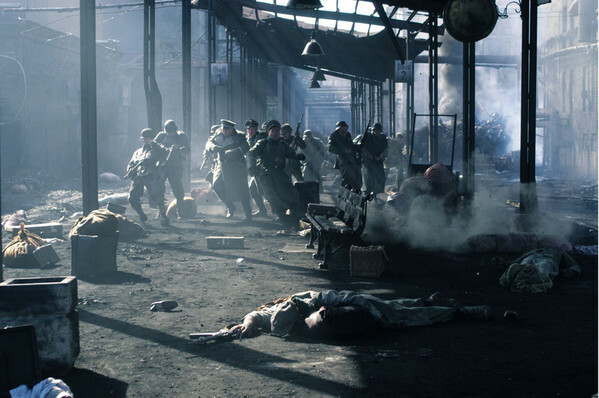 The narrative is careful to show pivotal events from the perspectives of people we know survived the war to tell their story. In most scenes, it's carefully established which witness was around. I'm in awe of Bernd Eichinger's script having to distilling so much information, while including so much detail. It was a shock back in January when Eichinger passed away at the age of 61. Check out his production credits, you might be surprised at how many of his films you know. Bruno Ganz's performance as Hitler is easily a career best. But there are many exceptional performances, especially from the women: Juliane Köhler as Eva Braun, and Corinna Harfouch as Magda Goebbels have extremely difficult scenes, but are utterly convincing. Alexandra Maria Lara, as Hitler's secretary Traudl Junge, has the central role, though is maybe a little too wise in some of her reactions. The UK blu-ray from Momentum shows up a lot of film grain, but the 5.1 soundtrack adds to the feeling of being surrounded by a constant enemy bombardment. There are commentary tracks, making-of featurettes, some very interesting interviews with the main cast and an insightful summary from Traudl Junge's biographer of how her full story came to light. 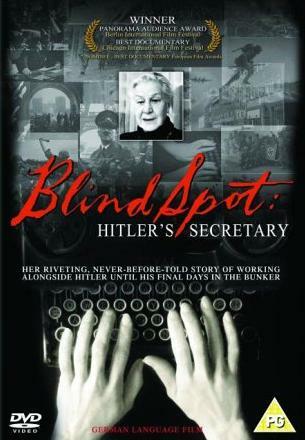 I then watched the documentary Blind Spot: Hitler's Secretary (2002) as a test of Downfall's accuracy. It consists solely of filmed interviews with Junge, shortly before she passed away. It was a surprise to see a couple of contradictions between her accounts and some of the events in Downfall, like how she escapes, which proved that it had exercised some dramatic license. But I was very impressed at how the accurately the film portrayed the atmosphere that Junge describes in the final days in the bunker. Junge talks about her life after the war, apparently dismayed how she was so close to Hitler for so long, while ignorant of what he'd been implementing. Her testimony is fascinating and not all of her stories are dramatised in Downfall, including an account of how his own men tried to kill Hitler (dramatised in Valkyrie) which actually ends up as funny. 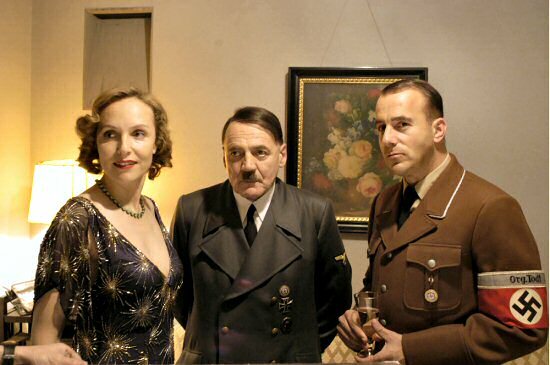 Publicity for Downfall says this was the first dramatisation of Hitler in a German film. But interestingly there was another German-language portrayal, which Traudl Junge also advised on, in 1955. 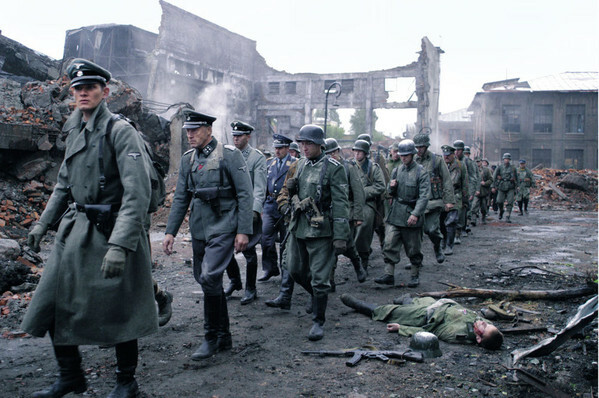 Der Letzte Akt (The Last Ten Days) was directed by the G.W. Pabst (Pandora's Box), but made in Austria. 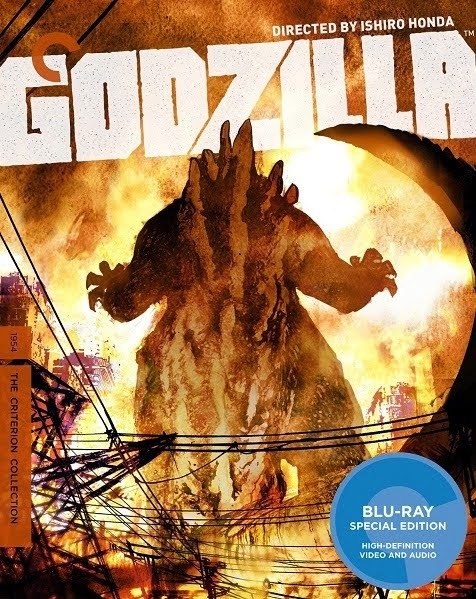 I can't find this available anywhere though. Blind Spot: Hitler's Secretary was shown as part of BBC's Storyville documentary strand, and has been on DVD in the UK and US. Melissa Muller's book, written with Traudl Junge, is still widely available.